We are a globally operating company for mobile measurement technologies, DAQ software, engineering services, and test bench technology for the automotive industry. Since the foundation of our company in 1989, most of the OEMs and Tier 1 suppliers trust in the high quality, reliability, and precision of our products and services, awarded with the Top 100 Innovation Award in 2016. This makes us an important partner, especially regarding the sustainable change in the automotive industry. We are organized in the five business divisions IPEmeasure, IPEmotion, IPEengineering, IPEtec, and IPEservices, which are strategically connected and interrelated in a unique way, enabling us to meet the demanding research, development, and testing requirements of manifold automotive and other industrial applications. Our wide range of highly precise measurement modules, data loggers, and sensors, combined with an efficient and powerful configuration and data acquisition software, offers state-of-the-art, field-tested technologies for harsh environmental conditions as well as a full application support for data busses, protocols, and control units. In addition to that, we provide extensive experience in vehicle and test bench testing, climate acoustics, thermal management, as well as test bench development. Our innovative solutions are developed in our headquarters in Baden-Baden and manufactured in Germany. Our sales network and subsidiaries all over the world ensure a global distribution with local support. With more than 180 employees, we work in Baden-Baden, Düsseldorf, Eichstätt, and Olching. With CAETEC GmbH and SAVVY® Telematic Systems AG, we integrated two subsidiaries specializing in telematic solutions and business intelligence as well as high-performance data loggers for on-board power supply development and fleet testing. Since 2001, we are owned by the INDUS Holding AG. Our slogan describes how we think, how we work. Professionally. Internationally. Across disciplines. Whether it is in our factories, on our test benches, at the customer’s, or in our offices – with our extensive knowledge, our need-oriented service, and our open and efficient project management, we provide our customers with answers to their questions, create new solutions, and are a reliable partner at all times. We understand ourselves as pioneers – we think ahead and create innovative strategies for the future. We thoroughly analyze the requirements and needs of our customers before we plan and implement the right solution with or for them. We develop hard- and software meeting the highest demands and offer reliable, premium-quality products and services. This is the reason why most of the manufacturers and suppliers in the automotive industry have trusted in IPETRONIK – for more than 25 years. Regardless of all the current changes in the automotive industry, we always stay true to our values. Because we strongly believe in our principles and act accordingly, we can take on responsibility for the present and the future and be open and flexible for change at the same time. We stand for innovation, quality, passion, team spirit, service, and responsibility. These are the values we feel committed to because our success depends on the way of thinking and acting of our employees. They are the foundation of our achievements. We constantly look for new horizons and develop farsighted innovations. We represent inventiveness and creativity and live optimistically in the present while shaping the future. In times of change, courage is the foundation of developing and implementing new ideas. IPETRONIK has always been courageous. We actively tackle change, strive for improvement, and meet new challenges. This is what keeps us one step ahead! IPETRONIK always applies the highest standards. We work in an efficient, customer-oriented, and innovative way and offer powerful and reliable products. We are committed to providing the best quality at all levels, every day. This is why we act with determination, focus on the result, and combine long years of experience with individual service and highest product standards. We spark passion – in our colleagues, our customers, our partners. We work with enthusiasm and dedication for our goals. We are constantly looking for new challenges, always strive for the best possible solution, and support our employees as well as our customers in putting their ideas into practice. We promote a positive attitude and encourage initiative, decisiveness, and independence in the people around us: This is how we transcend all barriers! We firmly believe that we can achieve more if we work together. Openness and honesty are the foundation of team spirit because they make a group a team and create an invaluable environment of trust and respect. All of our actions are shaped by transparency, consideration, as well as humanity and provide everyone with the opportunity to grow as a person and contribute their talents. By conviction, we stand for service and customer-friendliness. Our actions are shaped by expertise, innovation, and teamwork. Our profound knowledge of the market and the needs of our clients enables us to look ahead and work out the ideal solution. To live up to our aims, we continuously expand and deepen our knowledge base and encourage empathy, professionalism, and reliability in our employees – for a healthy and long-term partnership. We believe in responsibility and take it on – responsibility for the development of our industry, for the achievements of our company and, as a consequence, our employees, as well as for our customers. As a successful business, we also feel obligated to those in need. For this reason, we support various socially-engaged, professional, and charity organizations. Even if we were officially founded in 1989, the IPETRONIK success story already started a few years earlier. Since then, we have been expanding: more locations, more business divisions, more partners, and we are not about to stop. Our achievements do not only manifest themselves in the increasing number of employees but also in the continuously growing customer base, sales market, and range of products. In 1989, Bernd Pregger and Robert Heck founded the IPETRONIK Industrieelektronik und Vertriebs GmbH together with Horst Ihle, the main focus of the new company still being the mobile measurement technology, solely developed according to customer request until 1992. Having started with the development and production of the decentralized intelligent measurement data acquisition system KIM/SIM one year before, the first professional use of a CAN bus for mobile measurement in vehicles with IPETRONIK products was a big milestone in 1993. In the following years, IPETRONIK continued to advance the development of mobile measurement technology and demanding test bench applications. In 1996, the company provided the technical basis for complex applications such as commercial vehicle roller test benches and the measurement data exchange via GSM. Because of the increasing demand of its product lines (by that time already in serial production) at home as well as abroad, IPETRONIK decided to open a subsidiary in Sweden in 2000. In 2001, IPETRONIK was purchased by the INDUS Holding AG, providing the necessary support for the further growth. In the process of this acquisition, the Baden-Baden-based company with its approximately 50 employees was transformed into the IPETRONIK GmbH & Co. KG. It wasn’t long before IPETRONIK developed the continuously growing Asian automotive market with a distribution center in Korea in 2003. The success on the Asian continent lead to the establishment of a second distribution center in Japan only one year later. In 2004, IPETRONIK opened up a country with great growth and development potential. With the new distribution center in Japan, the company was able to establish important business ties, maintain the resulting contacts, and win more customers. In 2005, a US subsidiary was founded. With IPETRONIK Inc., the company expanded its presence in North America and developed yet another market for its products and services. Since then, the relations have been strengthened continuously and the customers have been provided with an optimal local support. With IPEmotion, IPETRONIK created its own software department in 2006. At first, the new business division’s main focus was the development of a configuration software for the IPETRONIK hardware, but soon it created a manufacturer-independent measurement data acquisition software for all test applications (i.a. configuration, measurement, control, visualization, analysis, and reporting). In addition to that, it developed plug-ins, add-ons, as well as customized solutions. The increasing demand of consulting and engineering services for vehicle testing lead to the formation of the business division IPEengineering in 2007. In addition to the core competences A/C systems and thermal management development, test bench, overall vehicle, and fleet testing, as well as climate acoustics, IPETRONIK also specialized in leakage measurement with its Federal Vehicle Registration Authority (KBA) certified testing lab. Only one year later, IPETRONIK opened up yet another vitally important automotive market in order to provide the Chinese OEMs and first tier suppliers with its holistic measurement and testing technology already in use at numerous renowned automobile manufacturers. In order to provide its own customized solutions for the development and validation of components and systems in development, testing, and production, IPETRONIK founded the business division IPEtec in 2010. Due to the continuous growth, a new technical center with state-of-the-art lab, test bench, and vehicle setup equipment was opened in the same year. Due to its continuous growth and innovation, IPETRONIK moved into newly built headquarters in 2011. The modern premises for administration, sales, development, support, equipment testing, and goods logistics provided ideal working conditions for the approximately 130 employees. 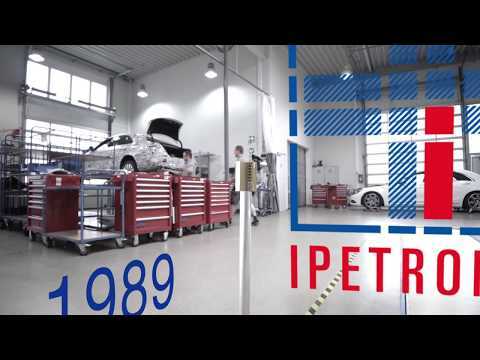 In 2012, the IPETRONIK Eichstätt GmbH, a fully-owned subsidiary of the IPETRONIK GmbH specializing in module calibration, vehicle fitting, and test bench testing for thermal management and vehicle air conditioning, was founded. In the same year, the joint venture TKI Automotive GmbH specializing in thermal management, comfort electronics, and interior air conditioning was founded together with the Audi Venture GmbH. In 2014, the expanding company opened another newly built production and administration facility. In the same year, it acquired the majority stake in the SAVVY® Telematic Systems AG, an M2M technology provider in the field of telematic business intelligence and fleet management for logistics and industry, effectively advancing its own technical development and widening its range of products and services. IPETRONIK also continued to grow on the international level. By opening new offices in India, the company expanded its presence on the increasingly important automotive market there and provided personal and local support for complex measurement technology solutions and consulting and engineering services. By the inclusion of CAETEC GmbH in the IPETRONIK group in 2016, IPETRONIK (by now consisting of over 180 employees) extended its drive train and thermal management product range with new data loggers as well as measurement modules and software. CAETEC develops measurement technology for vehicle testing, mainly in the fields driver assistance, bus analysis, and on-board supply systems. In order to offer their customers tangible added value with a range of services, IPETRONIK founded the business division IPEservices. For the entire period that the customer use the products, IPETRONIK support is readily available, to make sure that software packages, test benches, data logger, and measurement modules are in perfect operating condition.